Dressed, or finely cut, stonework is comparatively rare in Ireland; it was mainly used on grand houses, churches and public buildings. Many buildings are in rubble stone, often limewashed or rendered; however for the last hundred years brick has been the predominant material. Unfortunately, through time some of the skills and appreciation of the demands in working with stone have been lost. In the recent past it was difficult to get the right advice, the right materials and the craftsmen to work sympathetically on stone. Now the climate has changed, there is a revival of interest and it is possible now to have good work carried out – there are no longer any excuses for botched repairs and alterations. Stone buildings weather, often attractively, but pollutants can disfigure and decay. There is a long and inglorious history of attempts to slow down and stop this weathering process; many techniques have caused more damage than if the building had been left alone. Stone walls need to breathe and need to remain flexible. Lime should be the basis for mortars, grouts, washes and renders. Although non-hydraulic (putty) lime is probably the best for very soft stones and for interior work, it has proven very difficult to successfully use on exposed buildings in an unpredictable climate and so the trend has been to use hydraulic limes of an appropriate strength for the particular stone or brick. The great advantage, however, is that unlike pure cement mortors, lime mortars are breathable and flexible, with much less shrinkage on drying. This is especially important on soft sandstones, much less so on harder granites and basalts, where lime cement based mixes can be appropriate, especially in very exposed buildings. Pure cement render is not a suitable material for use on a historic building and is not a cure for damp problems. A lime based render or harling will invariably give the best weatherproofing and durability results on solid masonry walls. This is a very complex area and the specification of the best mortar, render or harling for any particular set of circumstances (type of stone, exposure etc.) needs to be carefully considered. Cleaning, if necessary at all, is an expert’s job and a complex process that requires a sensitive touch and deep understanding. High pressure grit blasting and indiscriminate use of powerful chemicals have caused enormous damage and must be avoided. Newer, gentler methods have been developed and are already in use. Above all, a full survey of the building needs to be carried out before any decisions are made, samples taken and tests done to determine appropriate repair, replacement and cleaning methods. Then a very detailed specification should be drawn up to ensure that the work is carried out correctly; good site supervision is essential. Stone walls are usually thick, 400–600mm is common, and inherently stable though the enlargement of openings or breaking out of new ones can be hazardous and should only be carried out with professional advice. Walls do move, bend, twist and lean and in modest buildings may have little or no foundations. Such problems do not usually require panic measures but an acceptance that old structures will not necessarily be square, plumb or true. Lime mortars and renders remain flexible and can accommodate such movements. Attempts to straighten walls will both remove the character and prove enormously expensive. External French drains, damp proof membranes in floors and electro-osmotic damp proof courses can alleviate damp penetration and, in most cases, original walls can be retained. Whilst building or repairing rubble stone walls is within the capability of good bricklayers and local masons, provided they observe and follow the pattern of the original and do not invent their own vertical crazy paving, ashlar and dressed stone is a specialist task. 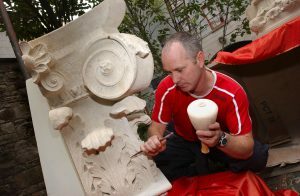 There are firms of experienced stone masons working in Northern Ireland who can repair and replicate fine stonework, and although much of the new stone currently used in decorative work is imported, many types of building stone are available from quarries in the British Isles. Statuary and sculpture require the most skilled of all conservators. Brick buildings abound in the urban areas of Ireland although there are few of the classic Georgian terraces left in Belfast, or indeed Ulster, to match those of Dublin. Bricks were made in local brickyards and often the names, such as Hampton, Laganvale or Annadale, were stamped into the clay. Most local bricks are bright red, a product of the local clays, but a burnt purply red, which has weathered to a very deep shade, is common. They are almost difficult to reproduce in new brick but there are some specialist brick manufacturers in England who can reproduce historic bricks from a sample. Many old bricks were to an ‘imperial’ size, deeper than the modern metric brick and of a different, more solid character when built. Some brick companies still manufacture a limited range in ‘imperial’ sizes. Seventeenth and eighteenth century bricks were often quite irregular and did not follow standard sizes at all. Traditional brick walls were solid, 9″ or greater, with a variety of bonds which give both strength and character. Most modern walls are of cavity construction which inevitably means a simple stretcher bond. Extensions to old buildings should respect the original bond types, either by using ‘snapped’ headers or a solid wall construction with the damp kept at bay by the ‘breathability’ of the wall and insulation taken care of on the inner face. Old bricks are invariably uneven. Lime mortar, as with stone, allows for flexibility and ensures that the shrinkage cracks, associated with modern hard cements, will not occur. The classic yellow stock bricks, often used in chimneys and quoins, and the blue engineering bricks, found in plinths, were mostly imported from areas with those colours of clays and are usually very dense and of high quality. Salvaged bricks can be found but good reproductions can be obtained. The pointing of stone and brickwork is critical to its character. A lime based mortar should be used, not hard cement, for the general principle of pointing is that the joints should be weaker than the brick or stone. Raised or strap pointing is nearly always wrong. Instead joints should be raked back to a depth of at least twice the height of the joint and the new mortar brought forward until nearly flush with the edges of the stone or brick, not covering them or smeared over the surface, and struck slightly (splayed from the top down) to throw the water off. Any mortar used in historic work should be in the range 1:3 lime putty to sand (weakest) up to 1:2:9 cement to lime putty to sand (strongest) depending on the nature of the brick and the degree of exposure to the site. The joints can then be rubbed down with a hessian bag or a soft bristle brush when nearly dry to expose the aggregate which should be chosen to match the original in colour and texture. In rubble stone work with wide joints ‘snecking’, small stones set within the mortar, is often found. 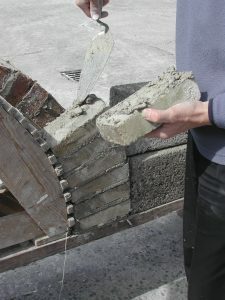 In ashlar work, with very tight joints, special techniques and grouts are required to pack the mortar into the joints and keep the surface clean. Rubble stonework was rarely built to be seen and the current fashion for stripping off the render can lead to rainwater penetration as well as being aesthetically unattractive. This is a complex subject which requires expert guidance. The choice of techniques available is outlined below in a simplified form. The first step in any repair scheme is to evaluate the existing state of the stonework and the degree of intervention and repair necessary. This evaluation has implications for the types of repair techniques to be undertaken and their application as exhibited by different stones or elements of the building. 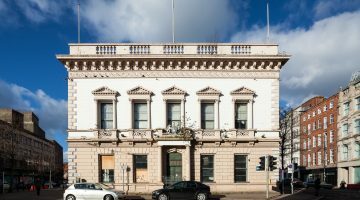 When various methods of repair are matched to particular stone problems, sometimes in one building or even a single façade, this is referred to as a ‘palette of techniques’. 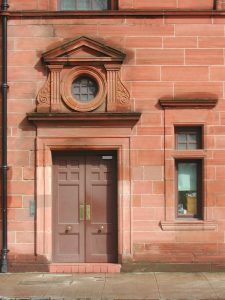 The overriding principle is to retain as much as possible of the original stone. This is an extreme measure, rarely necessary and very expensive, involving the complete rebuilding of a façade or building. It is often difficult to obtain original or compatible stone and this solution should only be used when there is complete failure of the stone or metal fixings. Weathering of stone is endlessly variable and individual stones may fail for many reasons – surface spalling, fixing failure, structural movement etc. Geological matching is critical to ensure compatibility of future weathering. Stones can be replaced either to full depth or, more commonly, to 75–100mm thickness, depending on the amount of decay of the original stone. Fixings may be necessary and should be of stainless steel to avoid corrosion. Where only a small section of an original stone is damaged – e.g. by rusting around a railing fixing – it is more appropriate to replace only a small section of stone. The new stone needs to be geologically matched, as noted above, to a similar 75–100mm depth, and should be tightly butted to the original, without expressing the joint, and fixed as necessary. In finer work much smaller indents are possible, often held in place with epoxy grouts. Large scale render or ‘plastic’ repairs are now largely discredited though this is a useful technique for small scale repairs to complicated carvings or sculpture. The renders must be of a ‘soft’ lime based mix to avoid accelerated weathering of surrounding stone. Stainless steel wire cages can be used to build up profiles. This is a technique for expert conservators, not a cheap alternative to correct stone repairs. Chemical consolidants can delay weathering of stone and help delay or avoid replacement. However, the associated chemistry and geology is complex and specialist scientific and laboratory assistance is required with full testing before application. 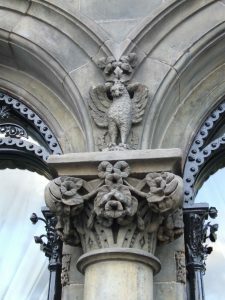 When surface failure has occurred a technique sometimes considered is the redressing of the stonework to its original profile. This is a skilled stonemasons’ task. It is possible to reface chemically consolidated stonework as discussed under item (e), particularly rock faced walling that shows facial deterioration. Generally only 15–25mm of the decayed stone is removed to allow realignment to the original profile. This technique is used for decayed stone deeply embedded within a wall which itself has minimal decay yet is disfigured. Door cases and window cills are particular examples on which this technique can be used.